Do you miss The Secret of Monkey Island? Can’t wait for another pirate adventure? Well, it may take some time until Guybrush Threp... Treed... that pirate dude returns, so how about adventuring with another hero? I present you Nelly Cootalot, and she’s also a pirate! Sort of. There’s no LeChuck in this point and click, but the enemy is equally mean – he’s responsible for the disappearance of the Spoonbeaks, cute and endangered birds. Nelly must investigate the Barony of Meeth and discover the truth. The first thing you’ll notice in Nelly Cootalot is the original graphic style, consisting of cutouts, something that is rarely seen even on commercial games nowadays, and it works brilliantly. Sure, it could have used a more diverse color palette, but the result is even and charming. The same goes for all the characters, perfectly drawn, and the only downside resides in the accentuated aliasing, mostly notable on Nelly’s edges. As far as gameplay goes, everything is perfectly though out. A mouse click skips a single phrase and a map avoids boring walkabouts, lessons that a lot of other games could take from this. The interface only shows three options: examine, talk and use, and the inventory is a model of functionality, although it could use smaller objects, for a better use of space (therefore dispensing completely with the scroll arrows). The music is very old school but fitting perfectly with the setting, and it can even be quite catchy. However, the main selling point in Nelly Cootalot really is the humor spread along the adventure. From the characters, scenery and particularly the dialogue, there’s quite a lot to make the player laugh. The story is very well written and even if it isn’t too big, it may last about 3 to 4 hours, which is great for a free game. 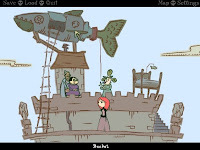 Nelly Cootalot is clearly a labour of love from its producer, one of the best examples of free adventure games, filled with humor. Fans of LucasArts adventure games of our youth, step in the shoes of Nelly, you won’t regret it.